The basics of nuclear chemistry start with radioactive decay. When unstable molecules break down, they emit one or more of several types of particles: alpha, beta, proton, neutron, and positron. Alpha particles are helium nuclei and have an atomic mass of 4 and a charge of +2. Beta particles are electrons with negligible mass and a charge of -1. Protons and neutrons are their usual selves, and positrons are just electrons with a +1 charge. Here we have the decay of radon-222, which emits an alpha particle (helium) and becomes polonium-218. As you can see, the equation is balanced for both atomic mass and charge, which must always be the case. Also, be wary of alternate notations. The above is most common, but do refer to the table below for a full list of symbols used in nuclear equations. Some isotopes also emit gamma rays when they decay. These dense bursts of energy do not have mass or charge, and thus do not need to be accounted for in nuclear equations. …where N_0 is the original number of radioactive atoms,N_t is the number of radioactive atoms remaining after t seconds, k is the rate constant (in units of Hertz), and t is the time in seconds from the start of the experiment. A good understanding of those four equations will have you able to solve any problem related to half-life. Simply be able to apply the right equation at the right time and plug in the appropriate numbers. 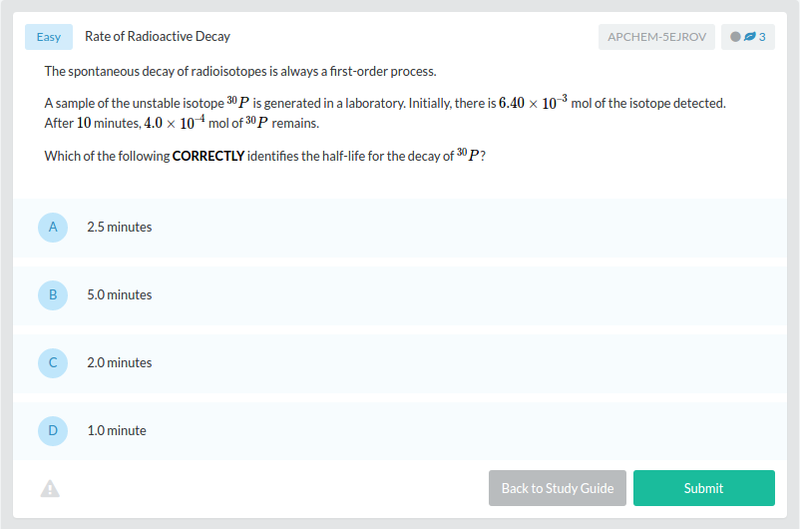 That covers the most important nuclear chemistry concepts you’ll need to know for the AP exam. As promised, actually splitting an atom is much more difficult.